Mike Gaylard from HartRAO was the "eclipse expert" for the eclipse tour group of the Public Communication of Science and Technology (PCST-7) Conference, held in Cape Town following the eclipse. He and Robyn Bloom took most of these pictures. Lily Whiteman and Tiziana Lanza, who were on the tour, have kindly provided some extra pictures. Welcome to Africa! 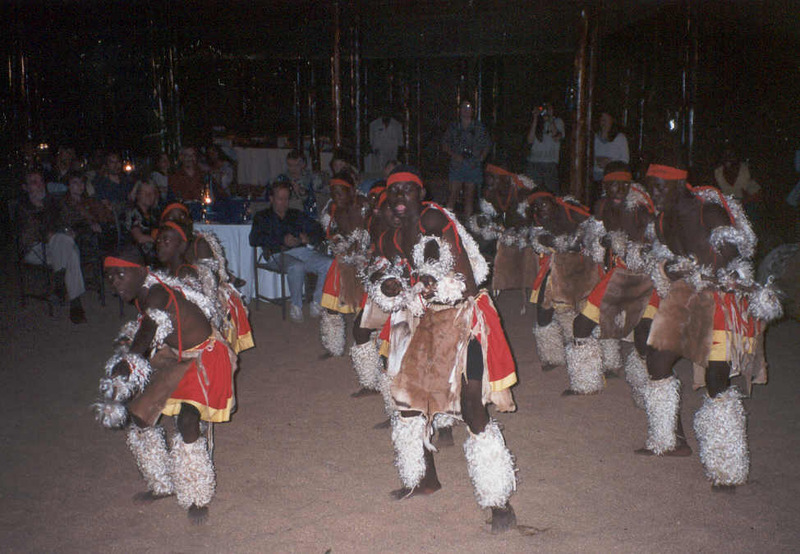 A group of young Shangaan dancers entertained us on the Monday evening during dinner in the boma at the Protea Hotels' Kruger Gate Lodge. 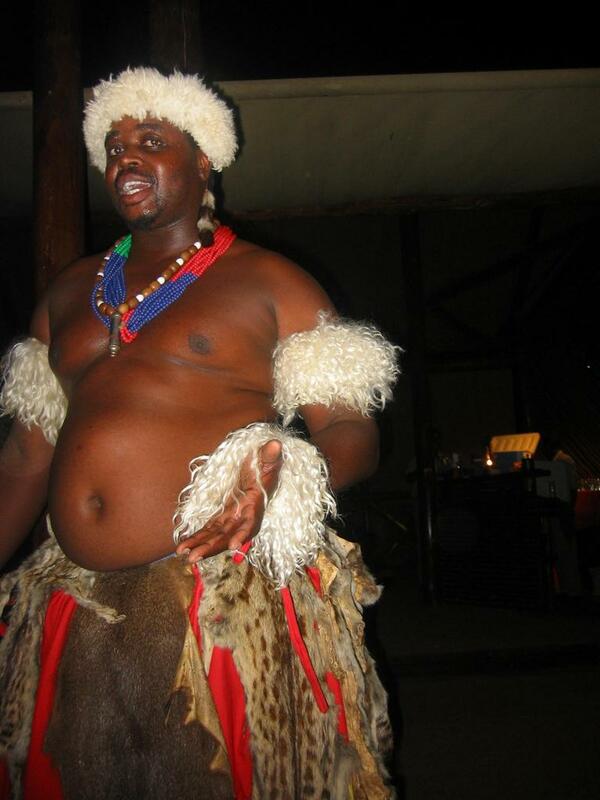 Here is the dance leader in action. Image courtesy Lily Whiteman. 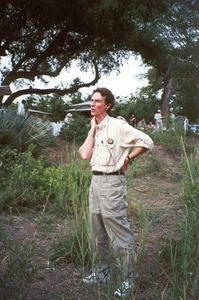 Mike during his talk on the eclipse for the tour group on Monday Dec 2. Why the white sheet? For use as a pinhole projection screen and for showing shadow bands. 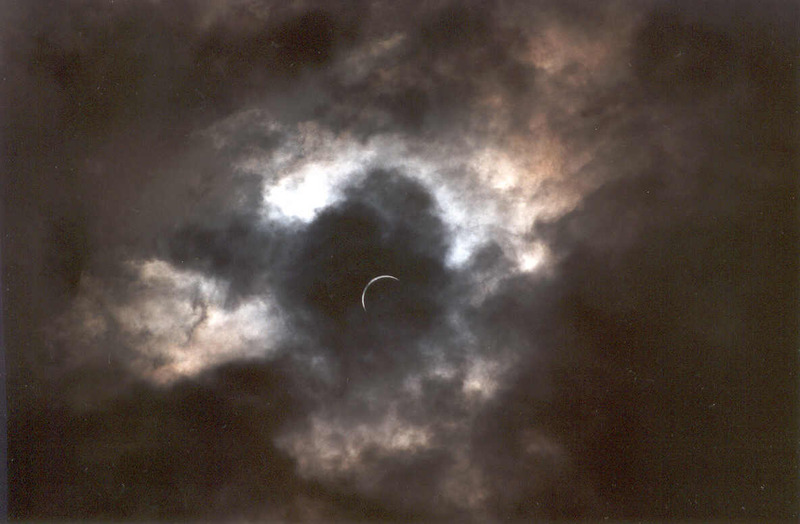 In the event, clouds prevented its use for this during the actual eclipse. 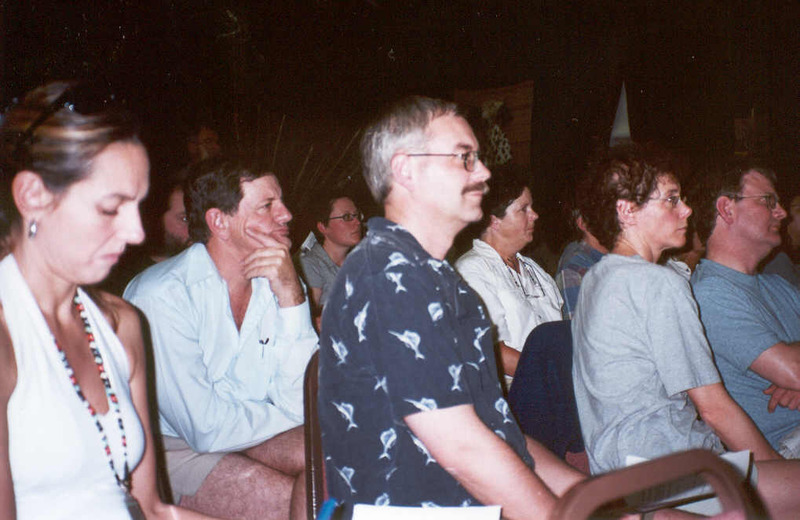 This eclipse stuff seems quite difficult... the audience get to grips with Mike's eclipse talk. On the left, Paola seems unconvinced. Paola Catapona of CERN grabbed Mike on Monday morning to participate in making a documentary on the eclipse. Here she looks at the Sun with eclipse viewers, while Silvano de Gennaro films from below. 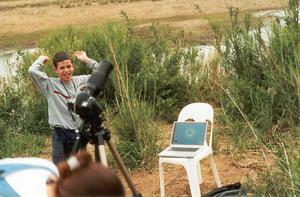 A spotting scope with solar filter is to Mike's left, binoculars projecting an image of the Sun in the centre. Assistant in red shirt is more interested in his own shadow. Mike explains binocular projection while Paola records in English and Italian. 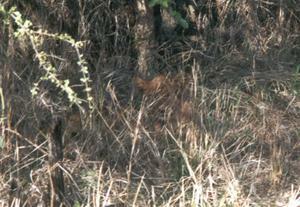 Can you spot the lion cub in the shadows? It is easier in the full size picture. 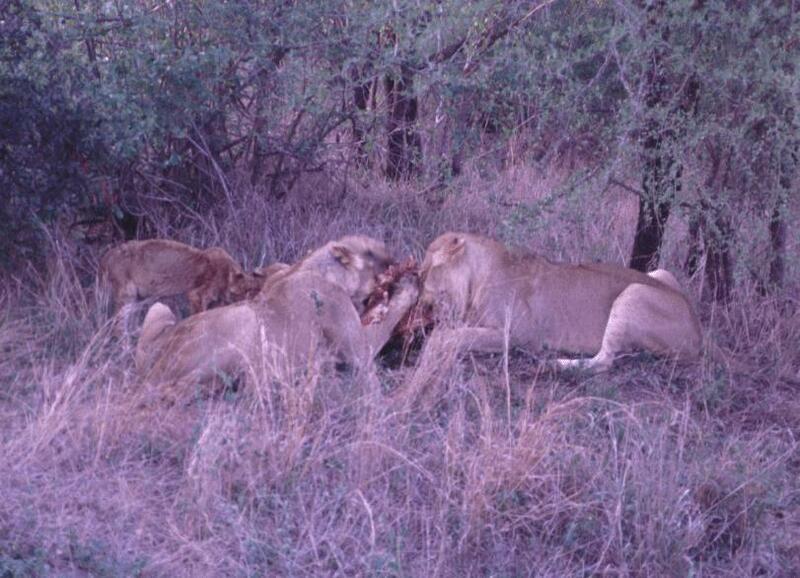 These lions were enjoying a hearty breakfast. 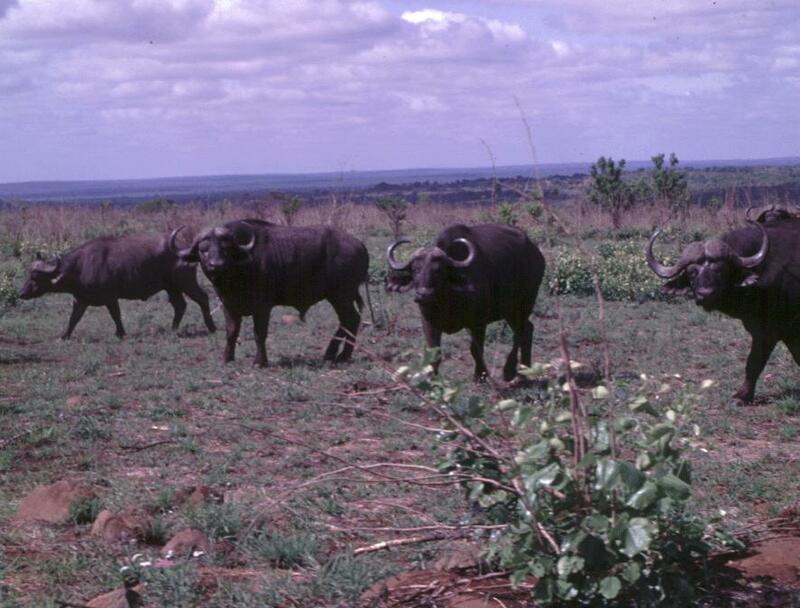 Fortunately for the vegetarians in the group, they were not right next to the road. Tiziana Lanza filmed the gory proceedings. A zebra crossing could not be ignored... 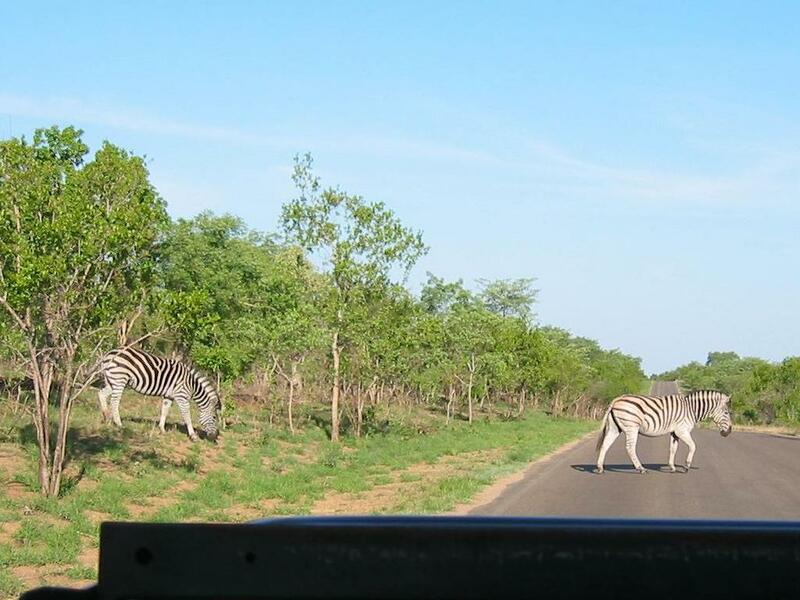 There is a marked difference in the stripes on these two Burchell's zebras. 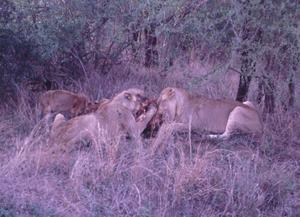 These animals are said to be the favourite food of the Kruger Park lions. 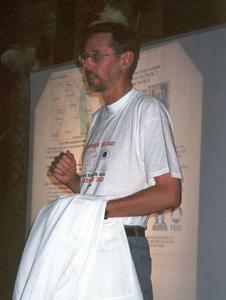 Image courtesy Lily Whiteman. This giraffe was nicely observed in the early morning light by Lily Whiteman. 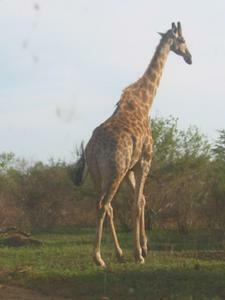 The Setswana speaking people name the stars of the Southern Cross and the Pointers "Thutlwa" - literally "rising above the trees" - and meaning the heads of giraffe visible above the trees. 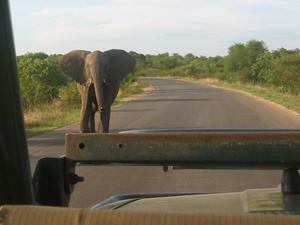 Visitors to game parks in Africa know that elephants have right of way... This young chap is just asserting his rights, and was well captured by Lily Whiteman. What could they be watching that are running in the road?? 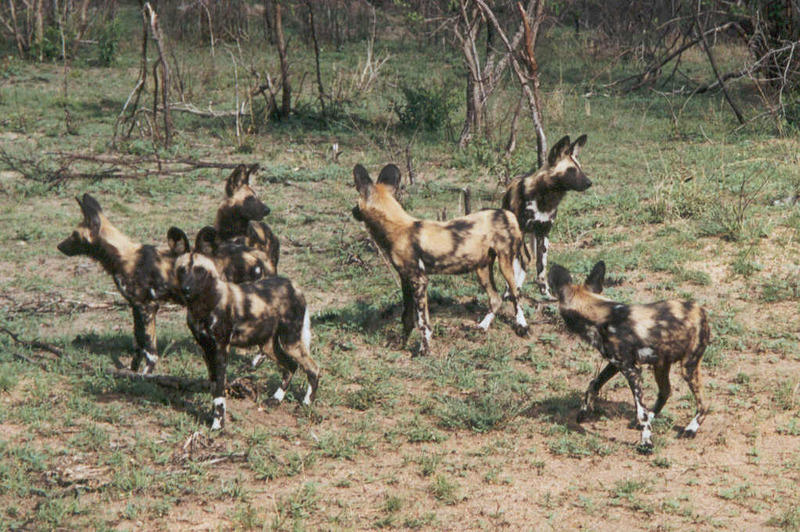 African wild dogs are rare and endangered. There are only a few hundred in the whole of the Kruger National Park, and we found a group of thirteen of them. 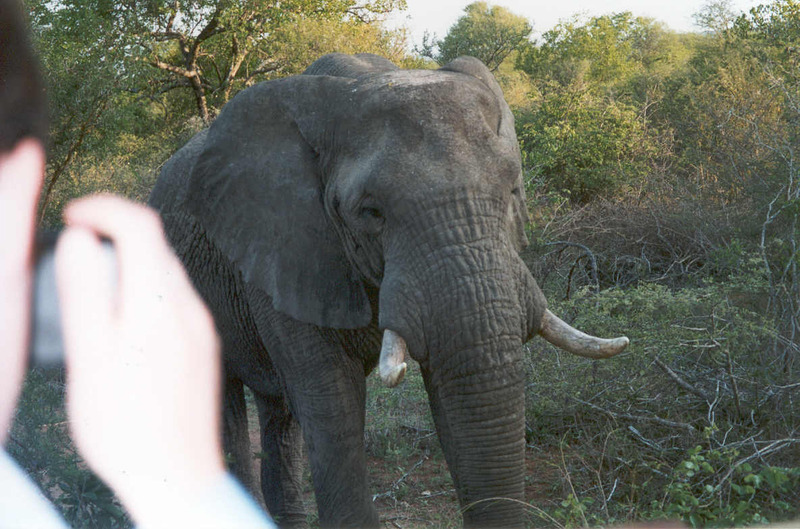 Here our game ranger / driver Dirk was imitating their calls, resulting in some quite confused animals as they tried to locate the source of the calls. 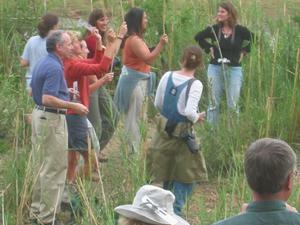 These are the youngsters in the group. 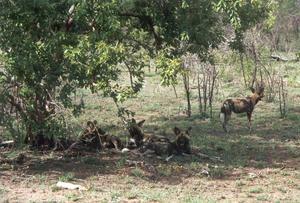 Here the alpha female lies up under the trees with some of her sisters. 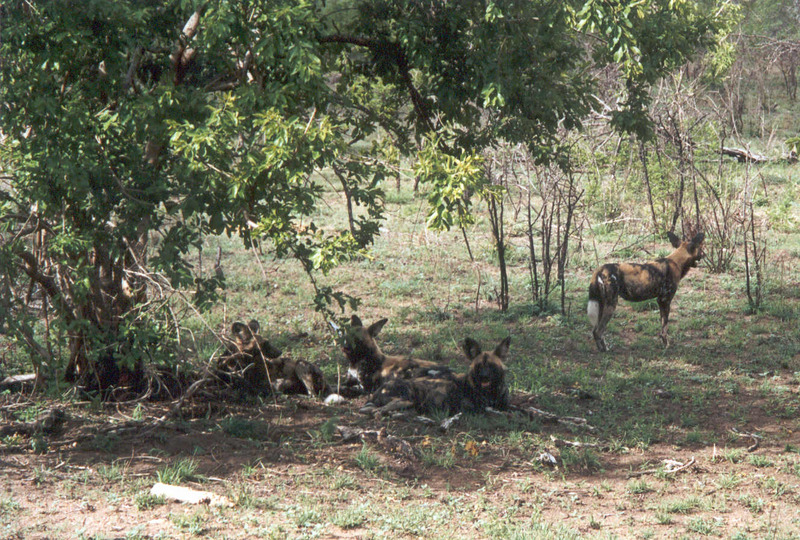 Wild dogs are rarely still. 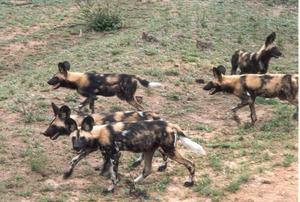 They are very responsive to any change in their environment. 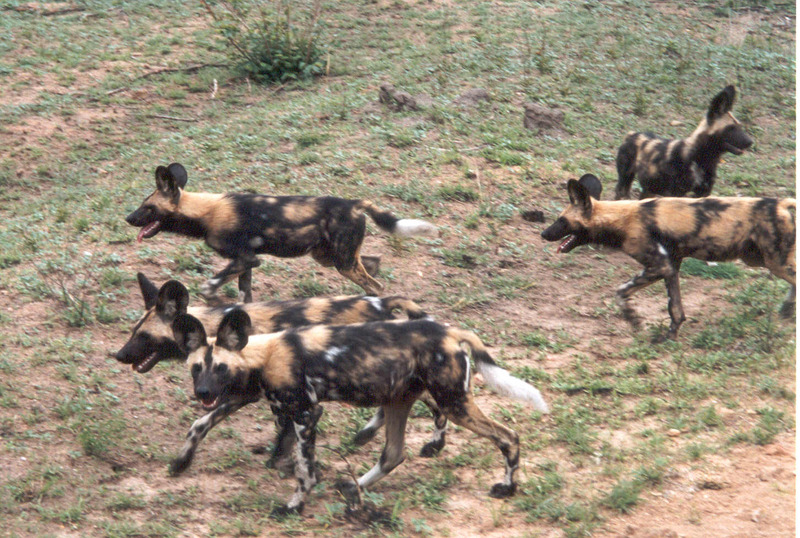 A prey animal could appear, or they themselves could become the target of predators such as lions, which could wipe out an unwary pack of wild dogs. 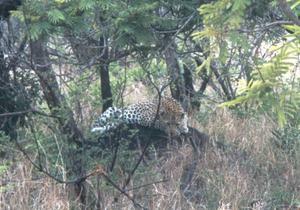 By contrast, leopards are solitary. 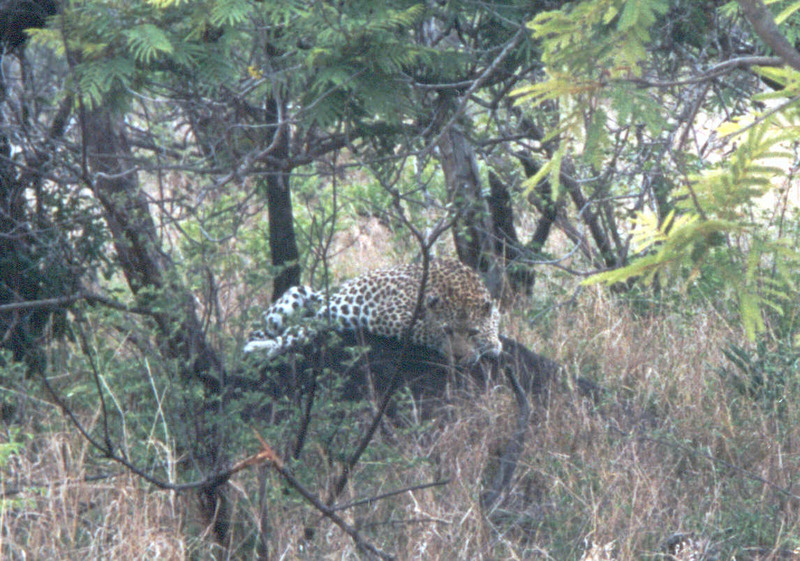 This one used a termite mound to provide a comfy resting place also giving it excellent visibility for spotting any approaching animal. On Tuesday evening at 22h30 we set off in our two buses for Phalaborwa gate in the northern Kruger Park, to get to our viewing site near Shingwedzi on the centreline of totality. 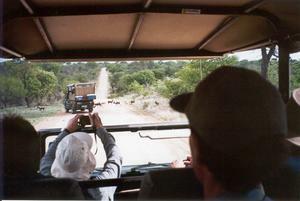 As we travelled, the days of cloudless skies came to an end as moist air rolled in from the Indian Ocean. After the overnight drive from Kruger Gate through Phalaborwa to Shingwedzi, we were ready for breakfast! Lily Whiteman captured the queue forming for eggs and bacon. 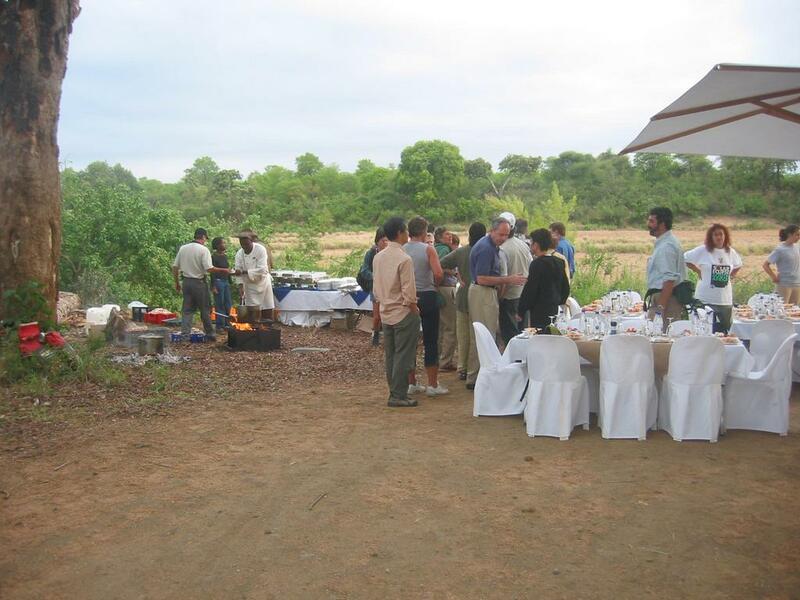 On the day of the eclipse, breakfast freshly prepared awaited us on the banks of the Shingwedzi river about two kilometres east of Shingwedzi camp in the Kruger National Park. 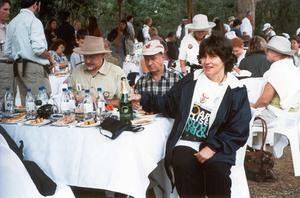 The "Eclipse Edition" Sparkling wine was popular. 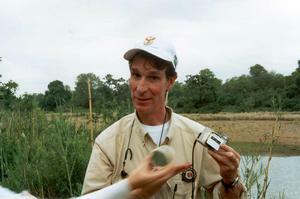 As we finished off breakfast, Bill Nye (the Science Guy) was already on line to CNN by cellphone (mobile phone). 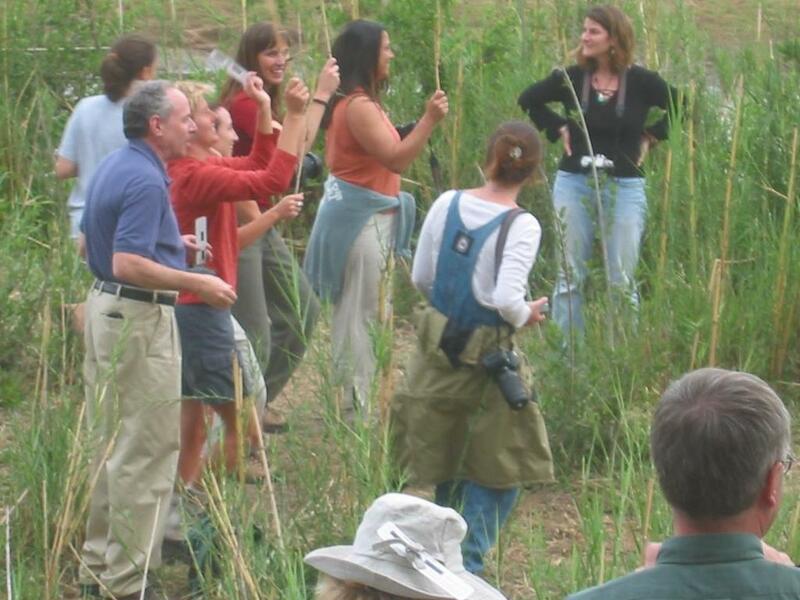 The group photo reveals the usual suspects and more. 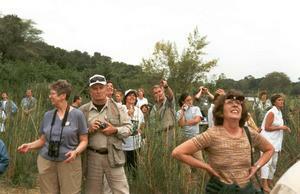 In the large version of the image one can see the two heavily armed guards at the back of the group. 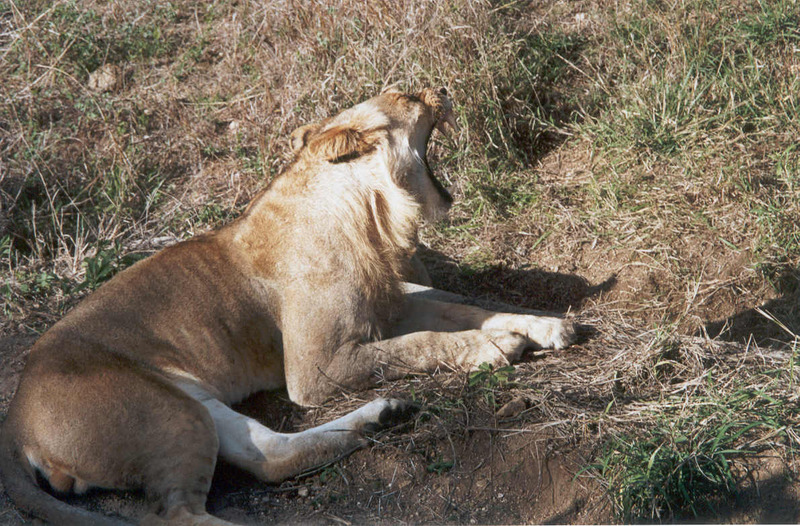 They were from the National Parks Board, who did not want their well-fed guests to become breakfast of some larger predator in turn - we had earlier been warned of four lions in the area. 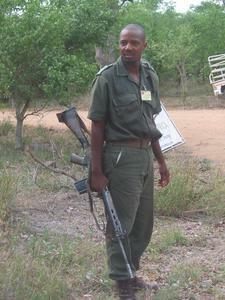 One of the guards with their standard issue FN / R1 rifles. 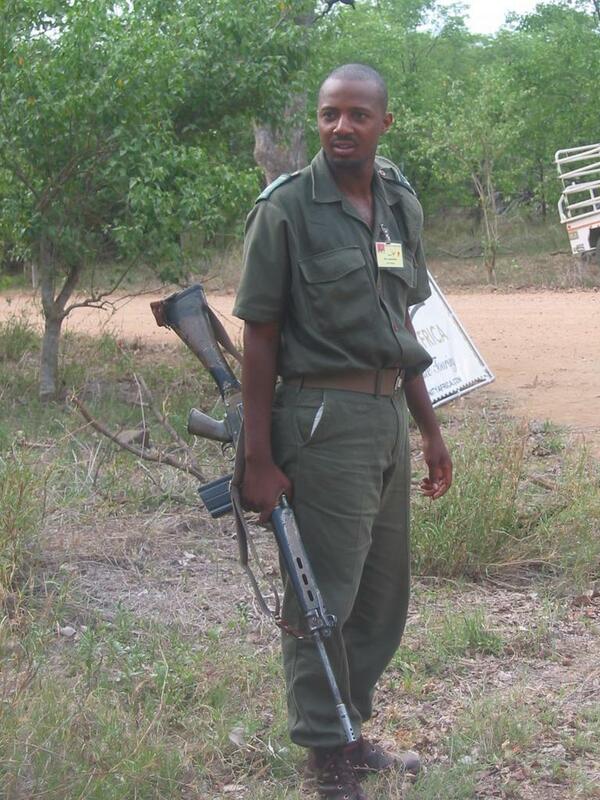 These 7.62mm calibre military rifles are needed to cope with the larger African animals. Fortunately they were not needed! Lily Whiteman took the photo. 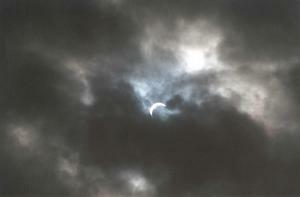 Breakfast over, we prepare for the eclipse as the clouds blow over. Here we are immediately above a section of the river. Hippo paths lead up from the river (on the right), and the tripods are placed around a large pile of elephant dung. The threatening clouds led to an impromptu anti-rain dance... A contrast to the usual state of affairs in Africa where rain is likely money - Botswana's unit of currency is the Pula, which is synonymous with "rain" or "wealth". These clouds in fact heralded the start of the summer rains for much of South Africa. 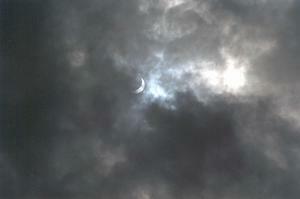 The eclipse has started. In the centre of the picture, Richard Martin of Affinity Africa points at the Sun with a bite taken out of it. The Sun appears every minute or two through thin patches in the cloud, as the "bite" grows. 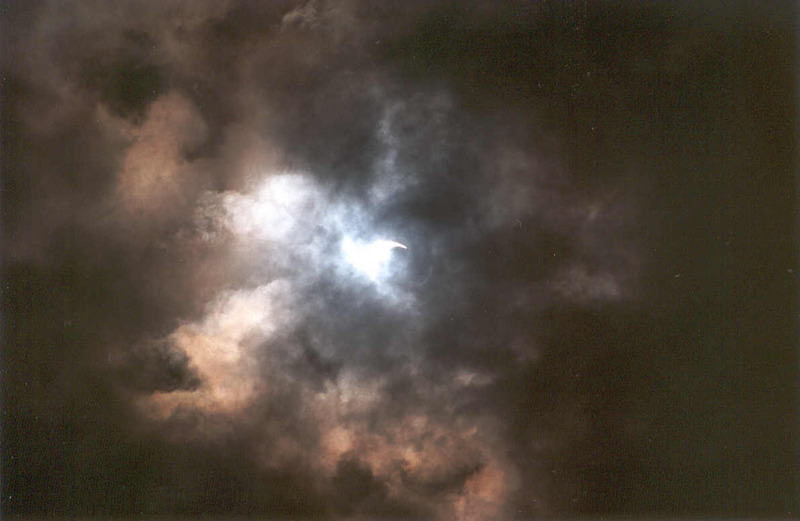 The clouds themselves act as solar filters, and the eclipse viewers are not needed! If the clouds intervene, at least we have virtual reality available! The river is visible beyond. By now totality was nearly upon us. 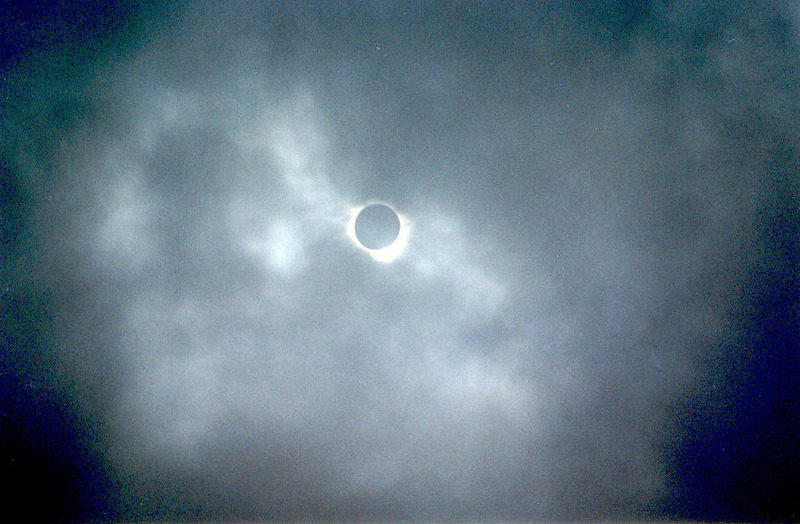 Not using flash, our hand held cameras gave blurred pictures during totality as they struggled with the very low light level. We turn instead to pictures of the Sun itself, taken with a tripod mounted 35mm SLR camera fitted with a 210mm lens. The Sun tantalises us through gaps in the cloud as totality approaches. With the Sun now more than 95% eclipsed, we just minutes away from totality. As the sun fades out, the decrease in temperature lowers the dewpoint and the clouds become even denser. Will we see the totally eclipsed Sun? The shadow of the Moon rushes at us from the North West. 86 seconds of totality start, and the dense clouds hide the Sun. But after 30 seconds or so, a thin patch crosses the Sun. 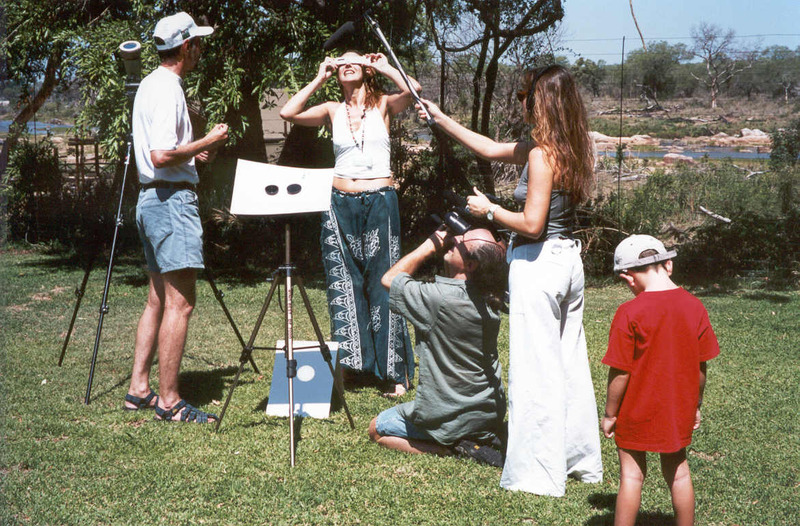 Tiziana Lanza captures some of the group staring at the eclipsed Sun, while others aim cameras and video recorders at it. We see the corona! 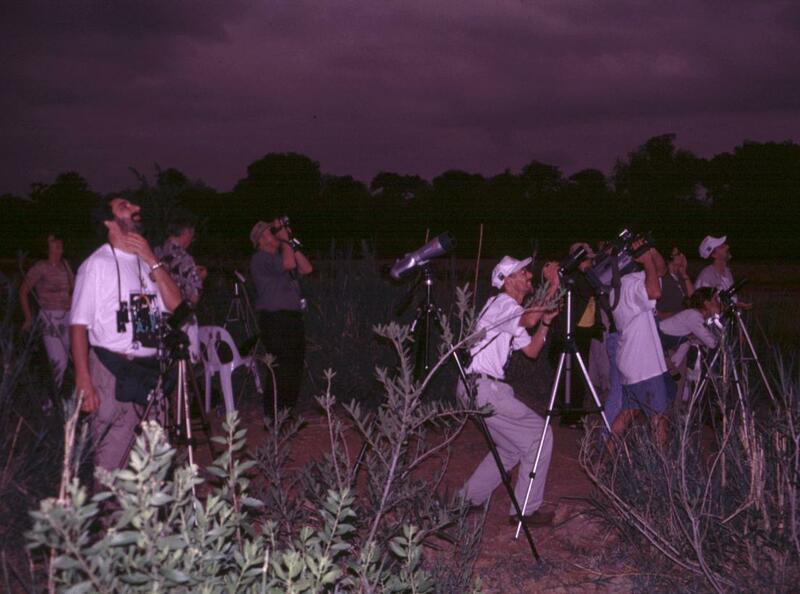 Pink flares from the Sun are apparent around the the limb of Moon. This was the photograph taken by the camera in the centre of the previous picture. After 10 seconds or so another dense wave of cloud crosses the Sun. Around us crickets are chirping and frogs are calling as though it were night. Our 86 seconds are up and light rushes at us from the North West. Amazing sights continue in the sky as the Sun edges back into view, like nebulae pictured by the Hubble Space Telescope. 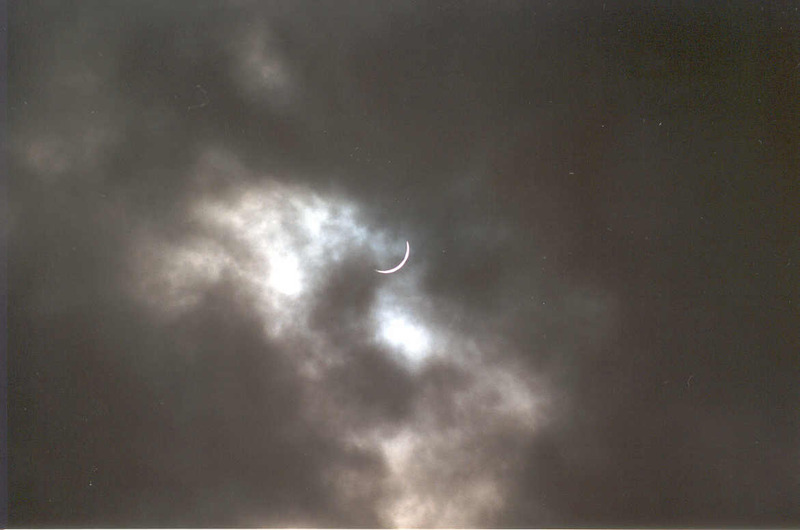 Here a denser patch of cloud shows the tiny sliver of Sun that has reappeared. The Moon is passing on its way, now a few minutes after totality. Totality is over! Richard is already on his phone, while some people still watch and record the eclipse. 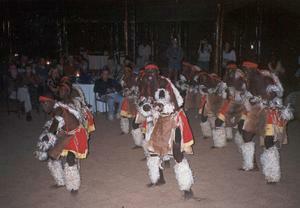 But we have to turn away to pack for the trip back to Johannesburg airport. 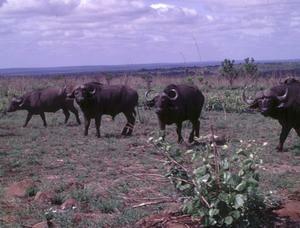 What was all the fuss about, these buffalo want know, as the bus rushes past. Tiziana Lanza took the picture. 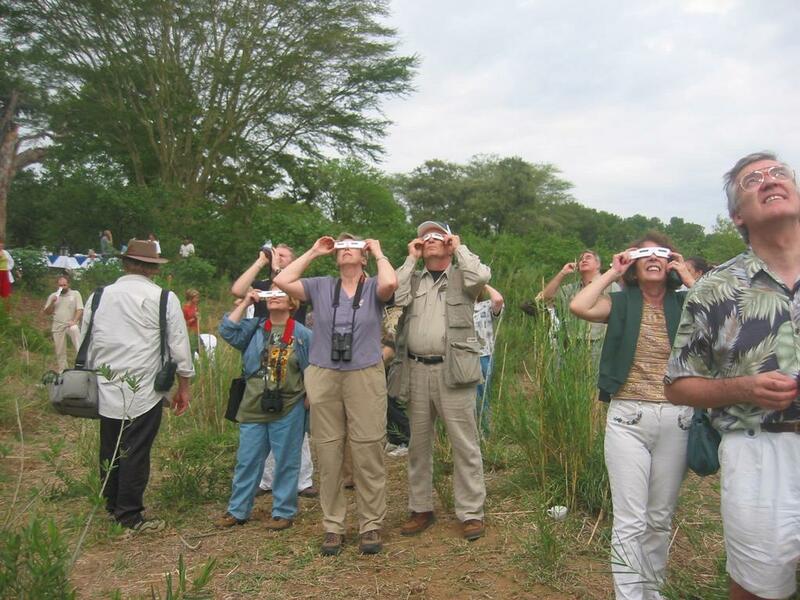 While not a classic eclipse of the sort experienced the previous year with cloudless skies at Lusaka, the drama was still amazing. We would like to thank Marina Joubert of FEST for adapting her schedule for the PCST-7 conference to make it possible to fit in the eclipse. 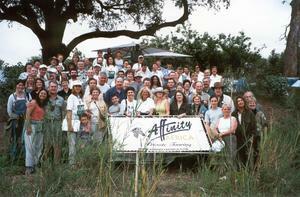 Affinity Africa did a superb job in making the whole eclipse safari a memorable and enjoyable experience. Protea Hotel Kruger Gate provided excellent accomodation and food and met our every request. 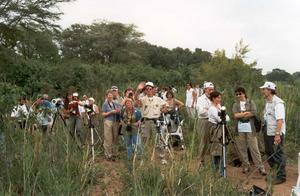 The safari game-viewing guides provided wonderful experiences with the wild animals in the Kruger National Park. Last but not least, the bus drivers provided us with smooth and pleasant trips across many hundreds of kilometres of Southern Africa. Ken and Sharon Friedman, who were on the PCST-7 eclipse tour, have put some of their Africa trip photo's on the web. And here are more eclipse reports.